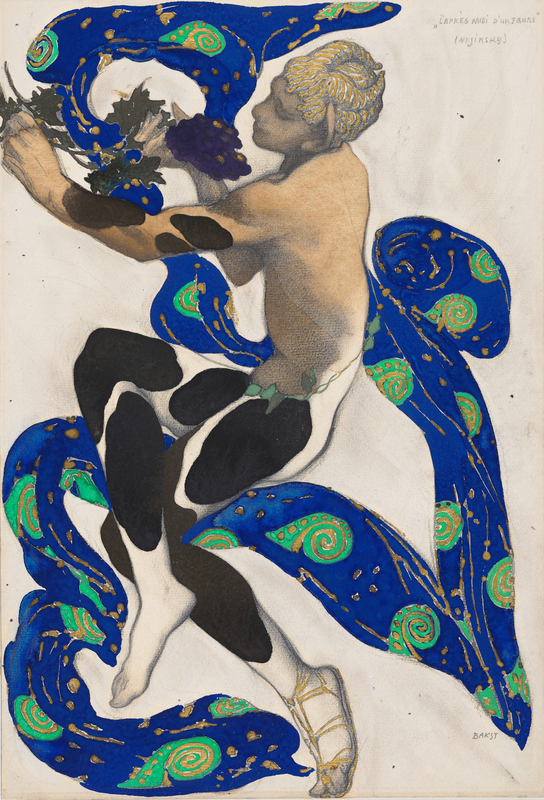 Diaghilev and the Ballets Russes, 1909-1929: When Art Danced with Music, on view through October 6 in the East Wing of Washington’s National Gallery of Art, amply supports Garafola’s observation. 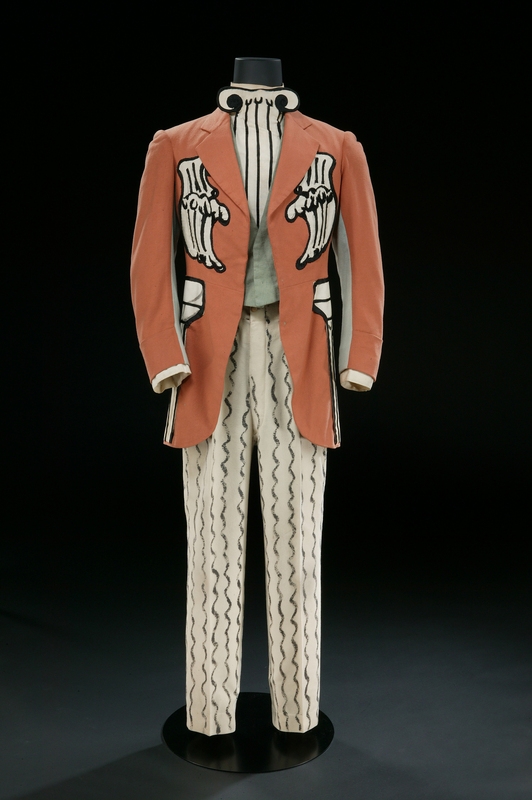 A handful of objects at the exhibition’s entry deftly and economically encapsulate the backstory of the multiple cultural spheres and influences that shaped Diaghilev, and that he would ultimately re-shape through his efforts. 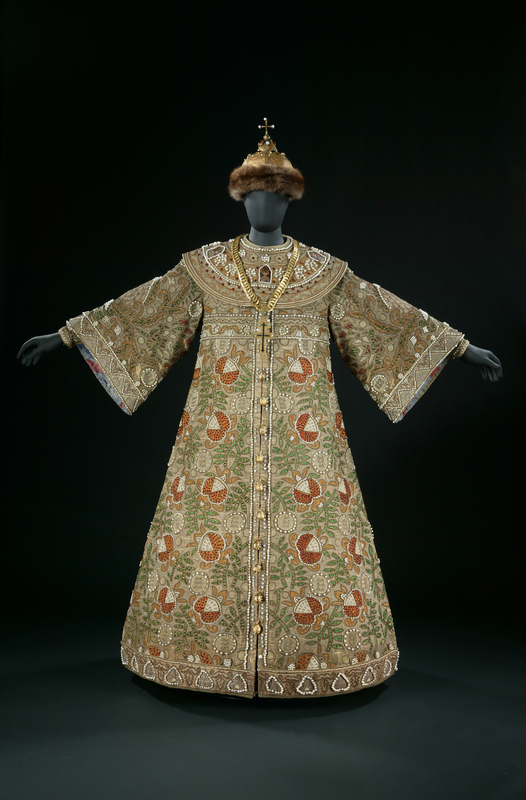 The opening set piece, Aleksandr Golovin’s costume for the coronation sequence of Boris Godunov clearly evokes the Imperial Russian framework which shaped Diaghilev and which he fervently promoted throughout his career as a cultural entrepreneur. Created for the legendary Russian bass Fyodor Chaliapin, the elaborately patterned royal robe, shot through with embroidered gold and dotted with seed pearls, proudly and unmistakably announces its “exotic” Eastern origins. Boris Godunov was Diaghilev’s first foray into the world of Parisian theater in 1908, subtly cueing the exhibition visitor to the roughly chronological trajectory. Financed in part by the tsar, the production was intended to reassure the French, who were underwriting an increasingly crippled Russia, that its eastern ally was indeed worthy of support. Music was also Diaghilev’s first love, and, as he discovered early in life, especially the opera stage as revolutionized by Wagner’s concept of gesamtkunstwerk (the complete work of art). It was an idea which strongly stimulated his developing aesthetic. Next to it are two copies of Diaghilev’s first cultural enterprise, the magazine Mir iskusstva (World of Art). One of the early issues from 1899 features the works of Aubrey Beardsley and the Pre-Raphaelites. Beside it, from a 1904 issue, is a woodcut of a duck in the distinctive lubok style of the Russian folk print. Taken together, these illustrate the “art for art’s sake” ideas of late Romantic Europe that Diaghilev promoted in his homeland, as well as an abiding respect for Russia’s indigenous applied arts that came together in Diaghilev’s World of Art. This, as the National Gallery’s recent Pre-Raphaelites: Victorian Art and Design, 1848-1900, with its selection of decorative arts from the allied arts and crafts movement, was a far from unlikely combination in late 19th-century Europe. This same merger of “fine” and “applied” arts featured in Diaghilev’s Paris premiere, an exhibition of 200 years of Russian art that he created for the Salon d’Automne in 1906. The catalogue for this show—graced with a folk-inspired interpretation of the double-headed eagle from the tsar’s personal flag—is seen between these two editions of World of Art. Facing these objects is an Alexandre Benois-designed costume from Les Sylphides, the epitome of a “French” Romantic ballet, and a larger-than-life-sized poster by Valentin Serov promoting Anna Pavlova in the Michel Fokine ballet’s 1909 premiere in the West. Pavlova was associated for a very short time with Diaghilev’s productions during what are known as the “Russian Seasons” before the Ballets Russes was officially founded. Between them, Diaghilev and Pavlova would show the world that ballet was the Russian art form par excellence and make the term “Russian ballet” a virtual tautology for much of the 20th century. 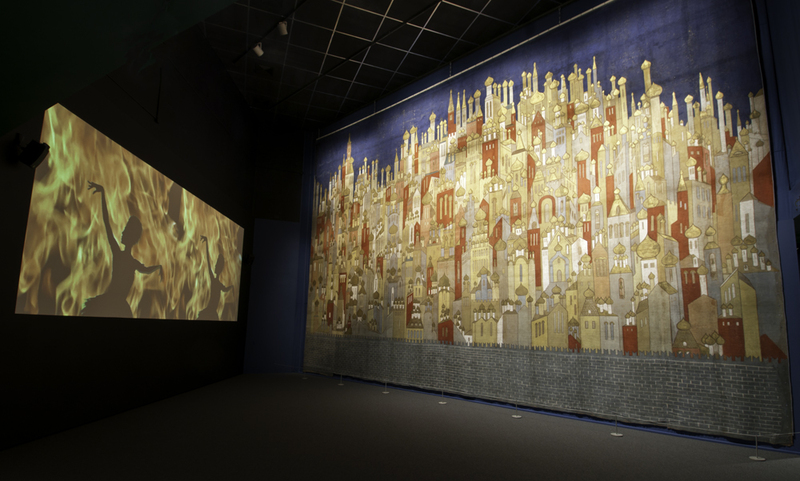 Set discreetly into the wall next to the costume, a poster and a set model for the ballet, all by Benois, is a video screen playing a short excerpt from the work. This black and white film captures just over a half a minute of a rehearsal of Les Sylphides by the Ballets Russes filmed covertly in Montreux, Switzerland, in 1928, the company’s penultimate year. It is the only known film footage of the legendary company. Diaghilev had banned any filming, fearing the commercial competition. But in the days before sound and color, he had nothing to fear from the cinema. The exhibition designers incorporated an extensive selection of video segments from key works incorporating landmark designs throughout the show. For the most part, these provide a successful glimpse into what the early 20th-century audiences actually experienced in the theatre, and provide the exhibition with a good portion of its popular appeal. As the film of Les Sylphides demonstrates, Classical ballet was, and remained, an integral part of the Ballets Russes — it was Diaghilev who introduced western audiences to the ballet we know as The Sleeping Beauty (called The Sleeping Princess when presented in London in 1921). This production, the grandmother of every subsequent production in the West, was enormously expensive — and it was also a flop financially. It was not what his audiences wanted from him. Although Russian dancing was superior to that being practiced in France, from which it had been imported by the tsars, the ballet there suffered from the same scenic malaise that had infected the art form for some time. Its costuming and scenery, however lavish, were generic at best — a lotus blossom sewn onto a tutu denoted ancient Egypt and an outsized reproduction of an engraved temple provided the backdrop. Before Tchaikovsky, to whom Diaghilev was distantly related, ballet music often suffered from this same formulaic quality. Diaghilev realized it was an art form ripe for the same kind of revolution that Wagner had wrought with the opera, and that is exactly what he brought to the dance. In one sense, the “women in white” of Les Sylphides represent what ballet in Imperial Russia was. The brilliantly hued, innovatively staged productions, in large part created by the team of artists who had joined Diaghilev in his World of Art venture, were what Russian ballet would become for Western Europe. 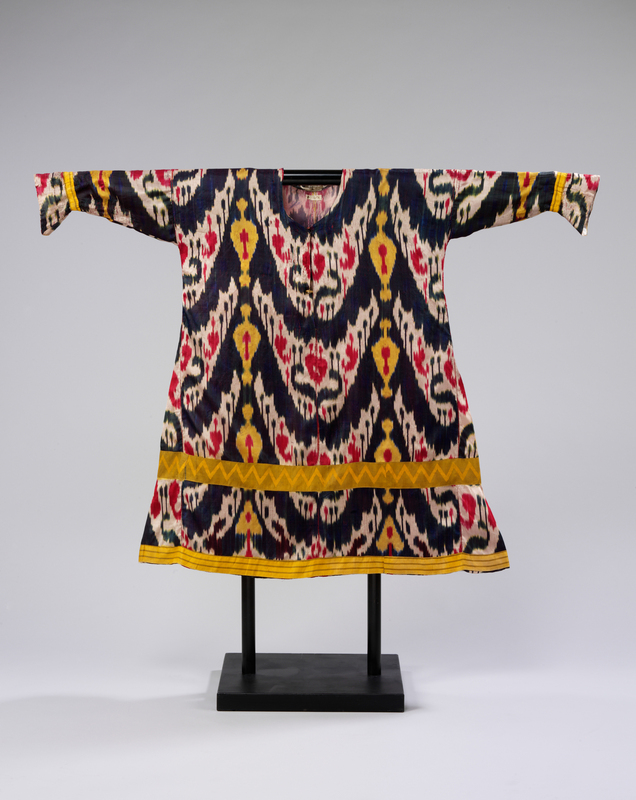 Nearby are Nicholas Roerich’s costumes for the Polovtsian Dances from Prince Igor, another of the ballets that Diaghilev presented to his Paris audience in 1909. Constructed from brilliantly dyed silk ikat fabrics from Uzbekistan which were purchased by Roerich in the street markets of St. Petersburg, they faithfully echo the costumes of the ethnic weavers who produced the fabric. They are a world away from the white tulle of the traditional ballet tutu. The Polovtsian Dances was wildly successful — it would become the single most performed ballet in the company’s repertory — and confirmed Diaghilev’s assessment that his French audiences wanted the Russia of its orientalist fantasies. Sharing the same case with the Roerich pieces are three Léon Bakst-designed costumes from Schéhérazade, a sizzling pot boiler of a ballet in which Diaghilev gave his audience precisely what it wanted. Set to pre-existing music by Rimsky-Korsakov, the ballet had an immediate impact on French popular culture. The harem pants, turbans and associated exotica designed by Bakst were adopted by the high-society fashion designer Paul Poiret and would reinvigorate France’s long-held fascination with oriental costume. 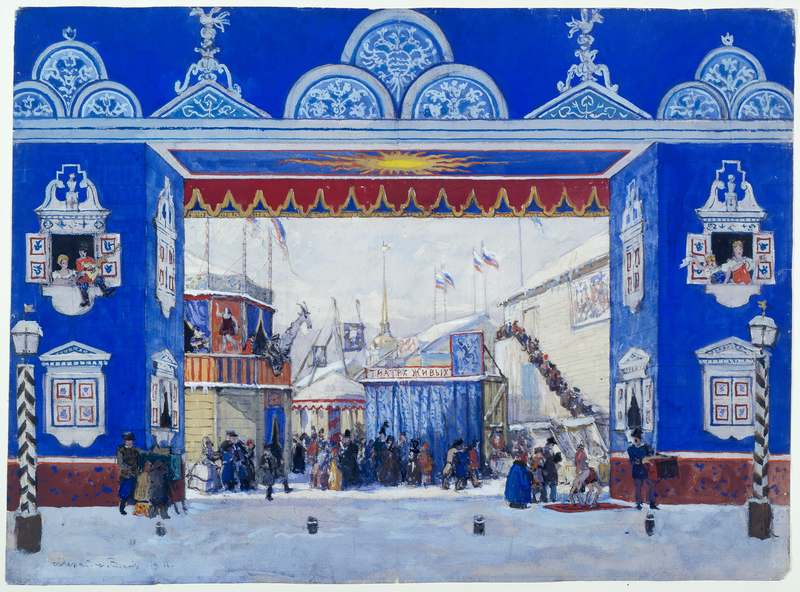 Across from the exotic costumes for Schéhérazade are a series of designs by Benois for several different stagings of Petrushka, a ballet that remains in the international repertory. Set during the traditional festivities of the pre-Lenten “Butter Week” fair of St. Petersburg, the ambience here is of Russia proper rather than one of its ethnic extensions. Although to today’s audiences Petrushka can come off as a straightforward story ballet, it was inspired by the then revolutionary theatrical ideas of Konstantin Stanislavsky and his Moscow Art Theater. The corps de ballet does not appear in neatly arrayed formation. Instead, each dancer is a character representing a specific profession or recognizable urban or rural type, not simple, generic country folk. Everyone who appears on stage has a personal history. This was indeed something new for ballet. Two brief segments from the Joffrey Ballet’s 1981 recreation of Petrushka convey a good deal of the animation that this element of naturalism injected into ballet at the time. In it, the presence of superstar dancer Rudolf Nureyev in the title role gives an idea of the impact that the Ballets Russes’ Vaslav Nijinsky had on the original audiences. The conjunction of Nijinsky and Nureyev continues with Debussy’s L ’Après-midi d’un Faune from a Joffrey Ballet recreation of the work from 1987. The close proximity of these large-scale video projections within the exhibition space produces some unexpected musical juxtapositions within the galleries. While initially distracting, these sonically dissimilar meldings give a sense of what it was like to experience an evening at the Ballets Russes. It was, after all, Les Sylphides with its Chopin score, which preceded Stravinsky’s The Rite of Spring in its raucous 1913 premiere. Yet what the audience experienced in 1913, represented here by the debated Joffrey Ballet re-staging from 1987, was not truly new. It came expecting the latest in Russian Neo-Primitivism and it got it. As the exhibition has already shown us, Stravinsky had experimented with complex metric modulations and challenging bitonality in more traditional narrative work Petrushka. Nijinsky had surprised the audience with strange, un-balletic movements, inspired by scenes from the Louvre’s ancient Greek vases, in his Faune. Nicholas Roerich’s wildly-colored evocations of traditional costume from the Russian empire had already dazzled Paris in the Polovtsian Dances. Still, the highly public premiere of The Rite of Spring brought all these elements together in a way that changed cultural history. Surrounding Roerich’s costumes for The Rite of Spring is a selection of works from other Modernist masters which take the performers and artists of the Ballets Russes as their theme. Although Diaghilev was incorporating artists directly into the conception of the works he presented, his performers continued to serve as muses to artists both inside and outside his direct circle. Jean Cocteau’s caricature of Stravinsky attacking a piano captures a moment that the dancers saw more than once during rehearsals when the composer would furiously pound out his challenging rhythms in an attempt to clarify the shape of his music. 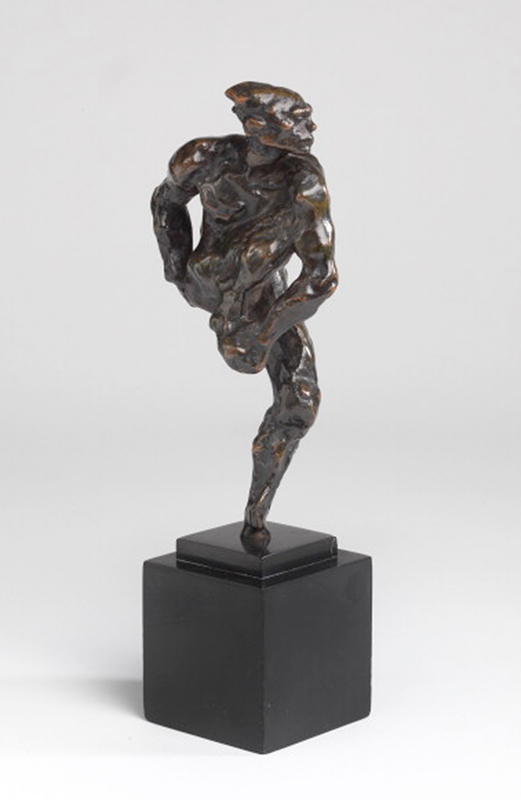 Auguste Rodin’s 1912 evocation of Nijinsky’s dancing is an even more direct attempt to capture action in a static form. With the roughly modeled dancer balancing on his left foot, right knee drawn tautly to his chest, the small sculpture is shot through with an animal vitality and a sustained tension that can be released only through a completely unrestrained leap. 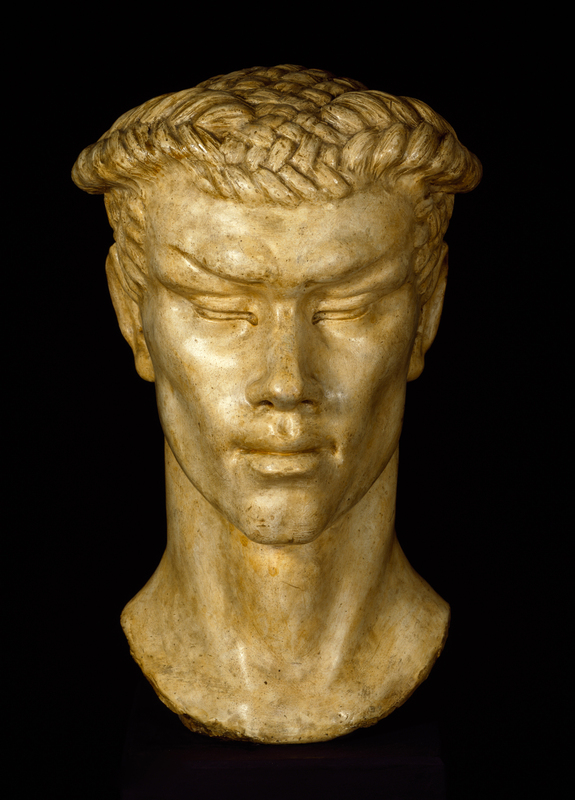 Without a doubt the most haunting piece in this section, and in the exhibition as a whole, is a “mask” drawn by Nijinsky during one of his earlier hospitalizations for schizophrenia in 1918-19 (another arresting image of Nijinsky, by Una Troubridge, is shown here). In some ways the interlocking geometric forms that form the face of Nijinsky’s mask, and the rhythmically repeated curved lines that give it a sense of volume, bear a superficial resemblance to the cylindrical forms of Fernand Léger’s “tubist” Exit the Ballets Russes from 1914 displayed nearby. But the obsessive repetitions in Nijinsky’s drawings are more reminiscent of Mexican-American artist Martín Ramírez who was also hospitalized with schizophrenia. It is difficult not to read the intensely agitated concentric circles that stand for the eyes in Nijinsky’s mask as a kind of spiritual self portrait of the dancer’s own tormented inner state. The ways in which Diaghilev’s Russian artists interacted with modernism are well illustrated in the second section of the exhibition, which opens with works by Mikhail Larionov and Natalia Goncharova. 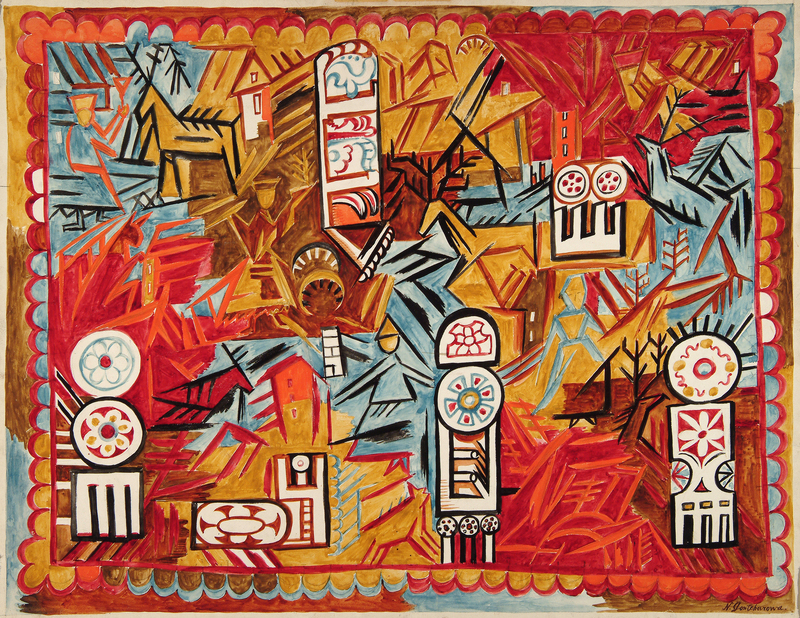 Working together, the couple created a unique fusion of elements borrowed from Russian folk culture, Futurism and Cubism that they called Rayonism, which, in theory at least, contained all the ideas of art that had preceded it. 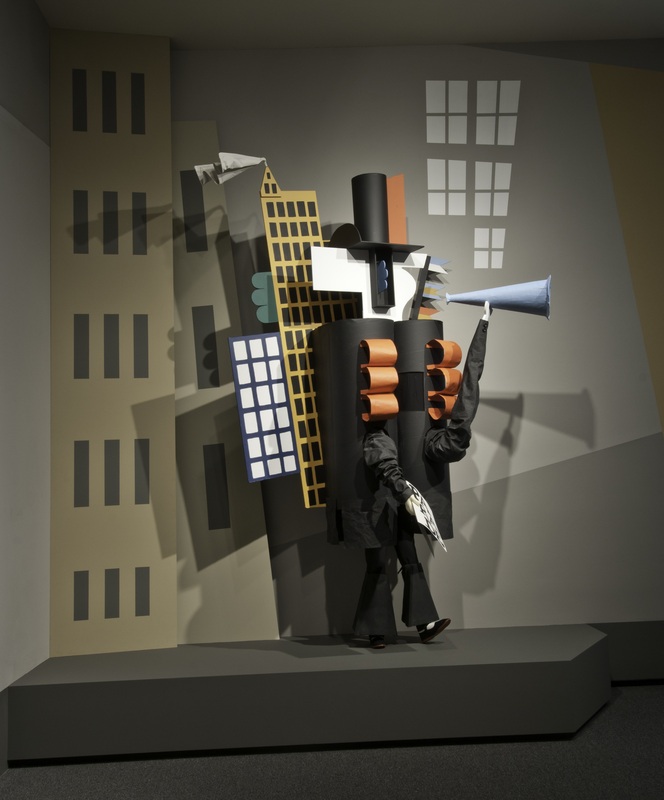 Cubist elements dominate in Larionov’ s costume designs for The Tale of the Buffoon, designed in 1915 and realized in 1921. Displayed so that exhibition audiences can see them in the round, as dance audiences would have seen them, they demonstrate one way in which Cubist ideas could interact with bodies in motion while maintaining their conceptual coherence. The folk-infused colors and compositional elements of Goncharova’ s 1914 set designs for The Golden Cockerel draw a fascinating parallel with Benois’ 1911 designs for Petrouchka. Both feature houses with spectator-filled windows as a framing element. While Benois’ houses are clearly differentiated within the architectural space, the same features virtually disappear in Goncharova’s riot of color and motifs drawn from Russian folk culture. The visual world of the Ballet Russes had clearly transformed itself dramatically after The Rite of Spring’s premiere. It is Goncharova’ s massive backdrop for the coronation sequence of Diaghilev’s 1926 production of The Firebird (which had actually preceded Petrushka in its creation by a year), however, that dominates the room, both physically — it is the largest single object ever shown at the National Gallery of Art — and conceptually. Its multitude of onion domes, layered and flattened, clearly incorporate Cubist ideas, yet are just as clearly Russian in their presentation. The backdrop provides an almost overwhelming demonstration of the effective and evocative merger of Eastern and Western ideas that exemplified the early Ballets Russes style — and does so on a literally theatrical scale. The outbreak of World War I effectively cut Diaghilev off from unfettered access to the artists of his homeland, before the Russian Revolution and subsequent developments in the new Soviet state permanently severed his ties with Russia. While choreographers from the East still provided the movement, designers from the West now provided the majority of the images — which were often the dominating element in the post-war Ballets Russes style. In point of fact, very little of the choreography from the era dominated by Léonid Massine survives, while the set designs of Picasso and Matisse have achieved the status of Modernist classics. Picasso’s designs for Parade prove the case. Although they do not represent the kind of watershed reached by The Rite of Spring, they are still considered as marking a definitive moment in the popularization of the Cubist aesthetic. The costumes for the two “managers” who promote the work of the various performers whose street acts provides what plot there is, are completely unwieldy. Performers can barely move within their confines, let alone dance. 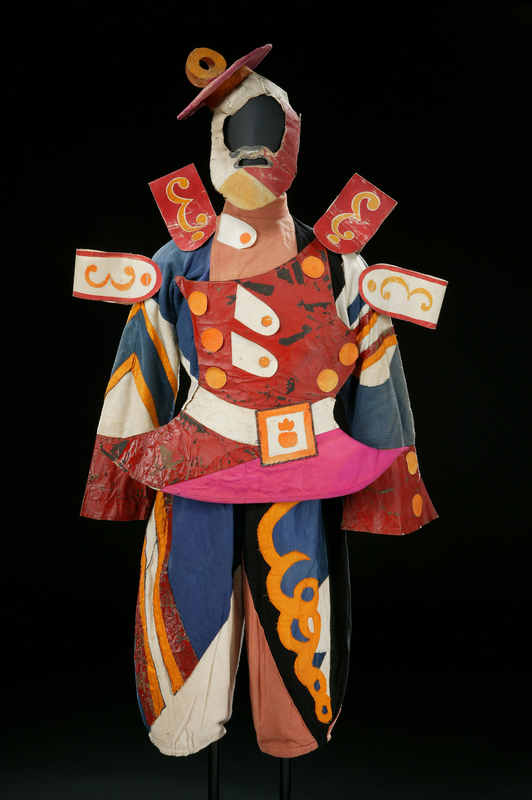 While the other costumes are more in keeping with the Ballets Russes style — the Chinese Conjurer is a particularly vivid example — Massine provided the dancers with precious little of interest to do while wearing them. The exhibition presents only one of the works originally created for the Ballets Russes in its entirety, a revised version of Balanchine’s 1929 Prodigal Son, with designs by Georges Rouault and music by Serge Prokofiev. A riveting 1978 performance by Mikahil Baryshnikov, then with the New York City Ballet, is nearly as good as dance in two dimensions can be. Perhaps not surprisingly, the small room where the work is projected inevitably clogs the flow of visitors within the galleries. Although highly representative of Rouault’s oeuvre, the designs for Prodigal Son — represented by a pair of watercolors corresponding to the backcloths for the ballet’s two scenes — never overwhelm the dance. Ironically, Prokofiev complained about Balanchine, the choreographer lionized for making the music with which he worked visible through his dancers, for not adhering as closely to his score as he wished. The costumes designed by Giorgio de Chirico for The Ball, presented in the adjoining room, provide a clear contrast to those of Rouault. While brilliant representations of the painter’s style, the costumes for the men were made to be seen and not to be danced in. Yet again, the scenic elements of the Ballets Russes trumped the possibility of choreographic excellence. Even the greatest choreographer of 20th-century ballet seems to have been at a loss with what to have his dancers do in them. When Art Danced with Music closes with The Blue Train of 1924 by another pioneering neoclassical choreographer, Bronislava Nijinska. Although she produced much finer work for Diaghilev — Les Noces, another work still in active repertory — it does not have the same visual appeal as The Blue Train. (In fairness, the much larger, original presentation of this exhibition in 2011 by London’s Victoria and Albert, from whose collection a substantial portion of this material has been drawn, did include Goncharova’s notably spare, almost minimalist, designs for Les Noces.) 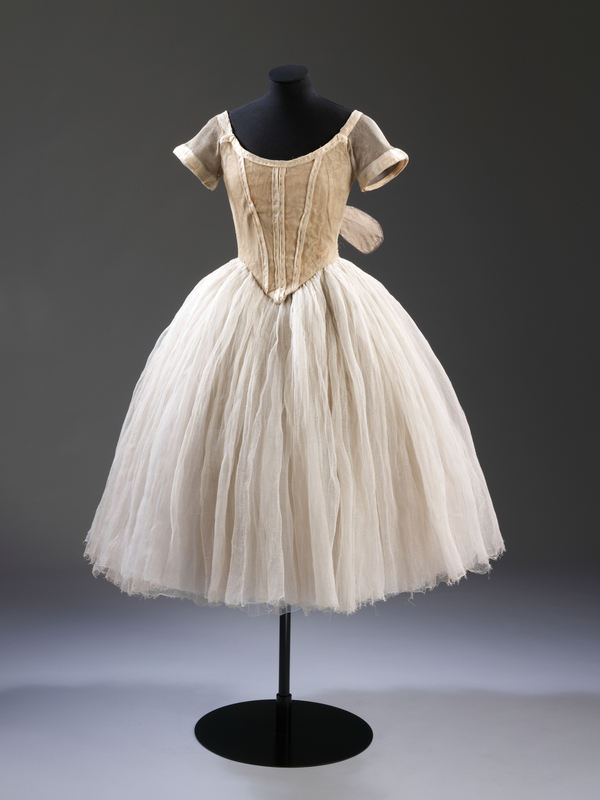 Diaghilev hired his friend and supporter Coco Chanel to design the sporty costumes for this ballet, which provided a strong injection of popular appeal. At this stage in its existence the Ballets Russes no longer needed to cater to the era’s elites, it defined its cultural elite. The real star of The Blue Train was its Picasso-inspired front cloth. 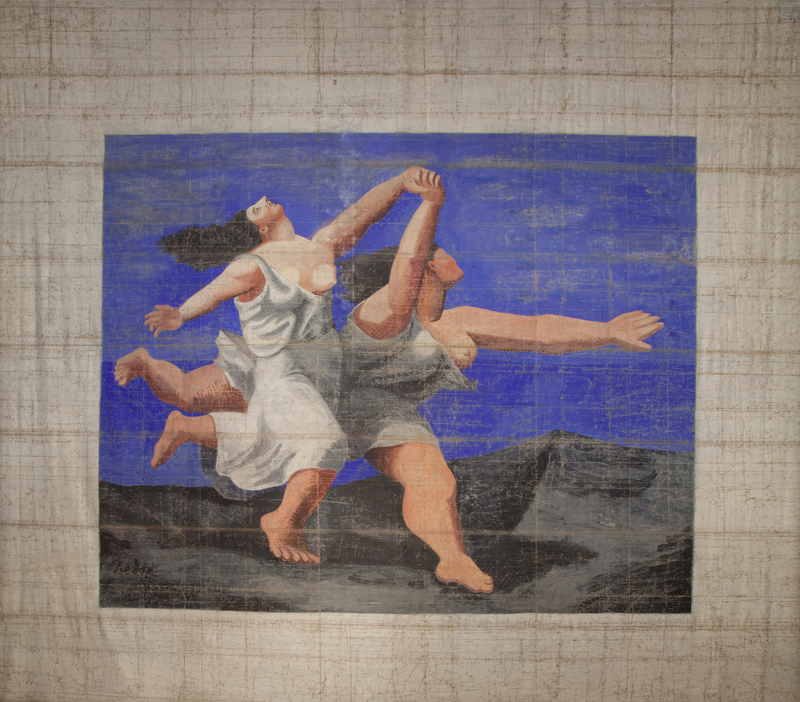 Even in its poor state of conservation, fully evincing the indignities inflicted by a long life in an actively touring ballet company, encountering Alexander Schervashidze’s massive rendition of the Picasso drawing is a jaw-dropping experience. In the original work upon which the curtain is based — seen in last season’s Picasso’s Drawings 1890-1921: Reinventing Tradition — the two female figures are decidedly monumental in proportions. Enlarged a hundred times or more they transcend the merely monumental to become iconic. Picasso was so pleased with the piece that he signed it and dedicated it to Diaghilev. It is displayed here in its own gallery — an honor it most certainly deserves. In time, the front cloth for The Blue Train became a kind of logotype for the company. Instead of introducing a particular ballet, it became the opening curtain for all of the Ballets Russes performances. Its omnipresent status gave the company a permanent visual identity and also helped cement Picasso’s position as a contemporary master in the minds of its international audience. The Ballets Russes aesthetic even touched places where the company itself never performed, as evinced by citations decrying its influence in the early polemics associated with the Mexican mural renaissance. The artistic interchanges that occurred through the performances of the Ballets Russes were remarkably fruitful. We will never fully grasp the extent to which Diaghilev’s productions influenced the art of the early 20th century — and how those influences continue to proliferate today. Diaghilev and the Ballets Russes, 1909-1929: When Art Danced with Music, nonetheless, provides a stimulating reminder that even the most ephemeral manifestations of human creativity are vital components in shaping the visual culture of our times. K. Mitchell Snow displays a depth of knowledge of dance and art that dazzles as much as the beautiful exhibit he describes. Kudos!